Brita vs Pur which company makes the better water filter for you and your family? When it comes to water filters Brita and Pur are the two of the biggest and best known brands. They make affordable and easy to use water filters that improve both the taste and the purity of your daily drinking water. Make no mistake about tap water doesn't always taste the best, depending on your local water supply you either end up water that has at best an either off putting flavor or it has a certain smell that's not quite right. For health reasons tap water is not the best option for your body some of the chemicals and metals that can found in a regular cup of water have been linked to some pretty serious conditions. ​Taste and chemicals are the main reasons why you should ditch the tap and find yourself a good water filter. A simple countertop water filter pitcher is what most people opt for. Sure you can install an under counter water filter but that's not always possible especially if you are renting or living in a college dorm. If you are searching for a water filter, chances are that you aren’t satisfied with the water flowing through the faucets, which, quite honestly, isn’t always of the highest quality. Not to mention, contaminants aren’t always immediately noticeable or even visible for that matter so it’s certainly reasonable to seek an additional filtration system. Contrary to local water supplies or even well water, home filtration is a visible process happening right in front of you and you have control over it. As far as small-scale domestic water filtration goes, Brita and Pur are without a doubt dominating but how do these two compare against each other? Given that both Brita and Pur are leaders in the industry and are in direct competition with each other, you are bound to see some extremely similar products and technologies with similar specs as well but that isn’t to say that they’re identical. Both brands are distinct from one another with a handful of notable differences but it all comes down to performance. Replacement filters for all products. Brita, however, carries a line of personal water bottles as well, allowing you to enjoy a degree of filtration on the go. It would appear that this product is unavailable under the Pur brand. Looking at the faucet attachments, you would see that both brands carry a basic model and an advanced model, the latter being the pricier option, of course. Pur has one up on Brita by offering an “ultimate” model as well. For the sake of fairness, this comparison takes a look at both advanced model filters. While they appear to be quite similar, there are some notable differences here. Brita specifically assures buyers of a BPA-free product whereas there appears to be no mention of this with Pur. It is also unclear as to whether or not the Pur filter is capable of any additional spray options. The Pur filter, however, is chrome colored, meaning that it is much more likely to match with your faucet. The horizontal design and 360-degree swivel could prove to be more convenient as well. The light on the Pur filter is a three-stage indicator whereas the Brita filter is a single light. Pur’s ultimate filter also has Bluetooth compatibility to closely monitor filter life. Price: The price may vary by location and store but you could expect to pay roughly $5 more for the Pur filter. Brita has a commanding pitcher platform with a variety of colors, sizes, and styles whereas Pur essentially offers a single style with varying efficiencies. While not available on all Brita filters, the real incredible feat here is the 120 gallons of water that can be filtered with each filter. While Pur’s filter does have a slightly larger capacity, the winner here is kind of clear. 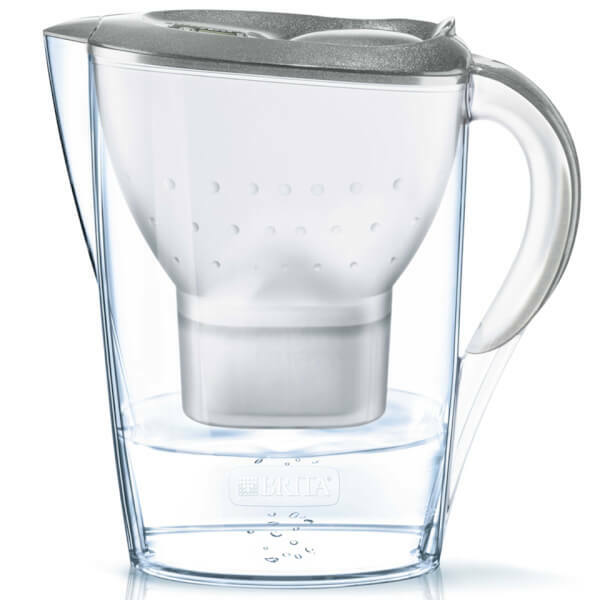 Brita’s line of filters is simply far more extensive than Pur’s, containing a handful of color options for all styles. Pur offers pitchers in red or blue but Brita carries a stainless-steel model as well as a number of smaller-sized pitchers that go down to as little as a five-cup capacity. While 120 gallons for the Brita pitcher is impressive, you may have to question the quality of the filtration given such a massive disparity between that and the Pur filter. Pur’s filters seem to filter out slightly larger percentages of contaminants such as lead and the 2% or 3% difference may not seem to be much but it can make a difference over time. Price: Given that Brita carries such a variety of pitchers, you could pay more or less depending on which style you choose. Brita’s most expensive option is higher than Pur’s. The dispensers make up each brand’s smallest inventory with two dispenser options from Brita and just a single dispenser option from Pur. Again, Brita boasts an incredible 120-gallon filter life compared to Pur’s 40 gallons. While other Brita products specifically indicate a BPA-free product, this one does not. Pur’s dispenser, however, is BPA-free with an 18-cup capacity as well. Pur’s filter may also filter out a higher percentage of contaminants. Overall, you’re looking at two very similar products with excellent reputations. If you are looking for a faucet filter, Pur’s chrome colors easily blend with the sink and its horizontal design optimizes space. While both filters need to be changed every 100 gallons or two to three months, the Brita may offer more spray options. As far as dispensers, you would be safe with either brand unless you’re seriously impressed with Brita’s 120-gallon filter life; Pur again filters slightly larger percentages of contaminants. Brita really shines with their pitchers and if you’re looking for a pitcher, you will find a far better selection with the Brita brand.